The incident occurred back in April of 1992. While driving home from work, a lady in a Nissan NX decided to make a left turn from the right lane while I was next to her. I left an impression of the front of my Nova in her drivers door. 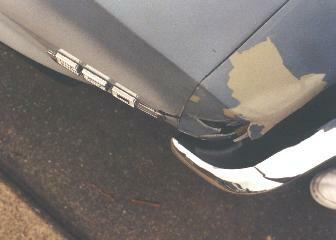 Her car was totaled and I drove mine home with only this damage. 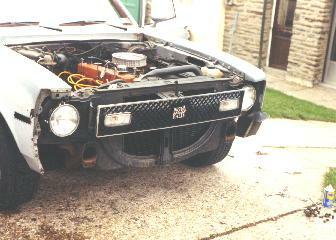 I was extremely lucky that there was no damage to the very hard to find grille. 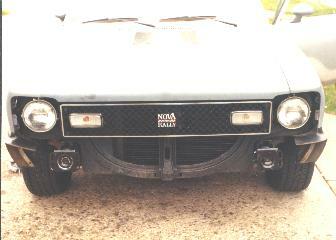 The grille is exclusive to 76 SS and 77 thru 78 Rally Novas. 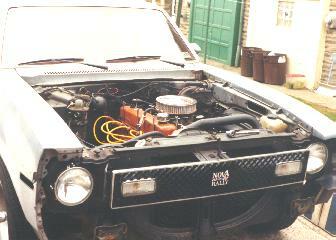 This one was found in a junkyard on a 77 Rally which is why the Rally Nova emblem is on there. I later found an SS emblem to replace it. 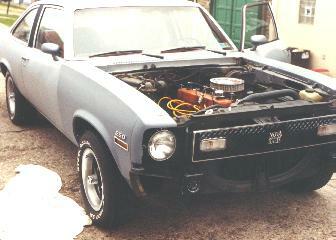 You will also notice the 68 thru 72 SS hood grilles. I loved the way they looked. When the steel hood was later replaced with fiberglass cowl induction one, these grilles went into hibernation in my basement. 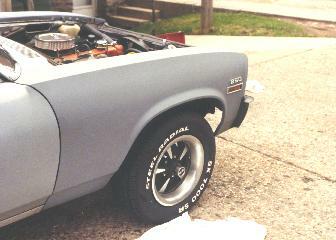 I hope to install them on another Nova someday. From this view you can see the fender extension is completely destroyed. When it cracked, it bent the fender where they bolted together. Parts list: 1 fender, 1 fender extension. From this view you can see the fender extension was pushed into the headlight bucket and cracked it. 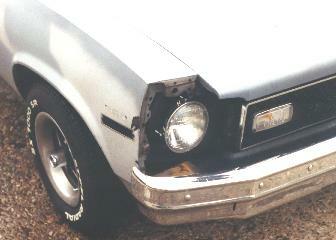 Add to parts list: 1 headlight bucket. 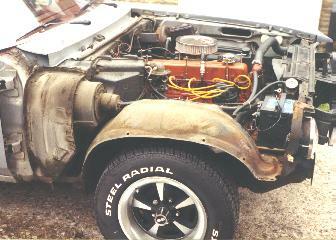 The bumpers of 74 thru 79 Novas are bolted to shocks to absorb 5-mph impacts. The shock did its job but didn't extend back out. 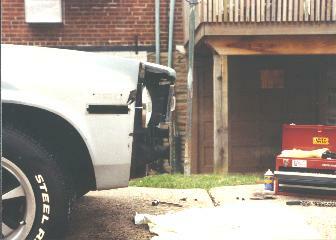 The bumper is now closer to the body on the passenger side. I'll replace them both since they are 16 years old. Add to parts list: 2 bumper shocks. 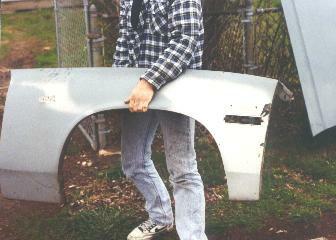 Because the bumpers give and the impact was more than 5-mph, the bumper was pushed into the fender where wrinkled it. 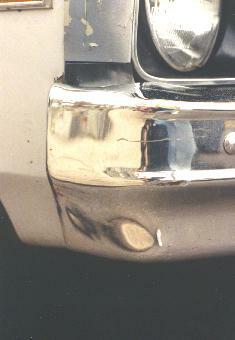 You can also see that the top of the bumper is buckled up because the outside edge has been bent in towards the fender. 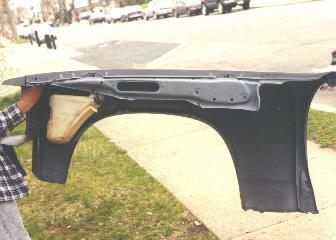 The bumper isn't bent that bad, however, so it will remain until it's replaced later with a fiberglass one. 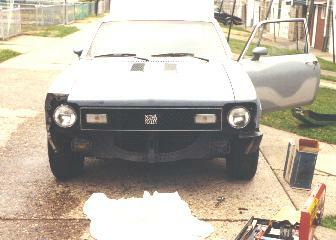 First I removed the broken fender extension and headlight bucket. 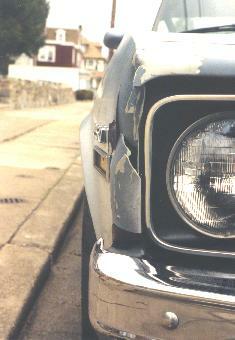 It makes the Nova look like it has a black eye. at the same time I paint the new passenger side bucket. 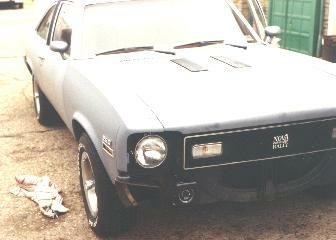 Next off was the front bumper. A cool side shot of the front without the fender extensions or bumper. 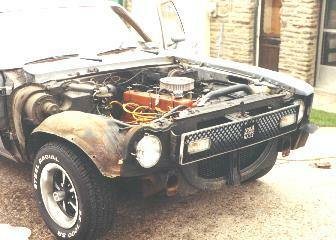 Here the bumper shocks were removed. For 75 thru 79 Novas, the shocks fit inside the frame and are held in with 5 bolts. 4 on the front and one at the rear of the shock. 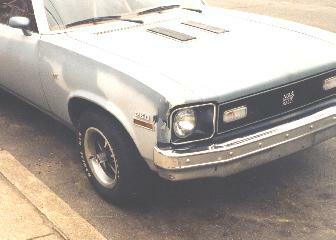 74 is the only other year Nova with these bumpers. 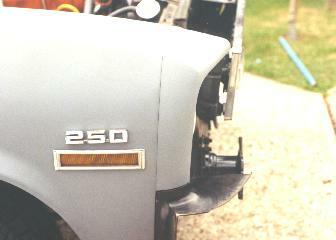 Because the 74 frame is the same as the 68 thru 73 Novas, a special bracket is bolted to the outside of the frame rails. The shocks then mount inside those brackets. Here is the old fender off the car. That's the hood in the background. Here's a look at the Nova without the fender. 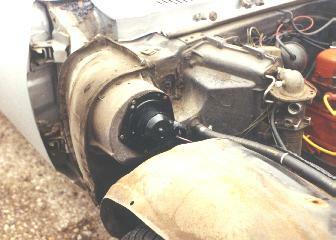 The inside wheel well was left in place. 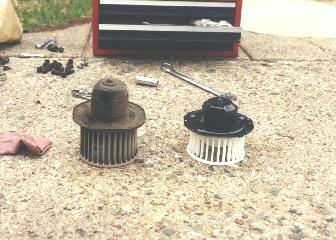 Since the fender is off, I decided to finally replace the blower motor. It worked 90% of the time, but on very cold days, it would squeal like a stuck pig. The bearings were shot. The old motor is out and ready for the new one. These pictures show the A/C box very well. 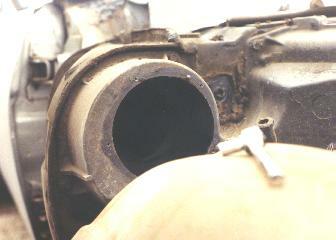 The small hose to the lower right of the hole provides cool air to the blower motor. new motor is physically smaller and has a shorter fan as well. be careful not to over-torque the bolts and strip out the holes. 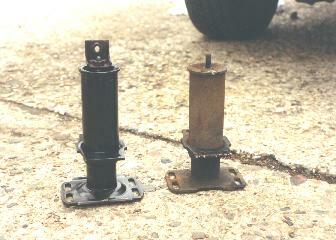 This is the new (left) and old (right) bumper shocks. You can see how much the impact collapsed the shock. This is why the bumper was still pushed in on the passenger side. There is a small bracket that bolts to the back of the shock. It allows the rear of the shock to be bolted to the frame. A bolt passes through the frame into the bracket. 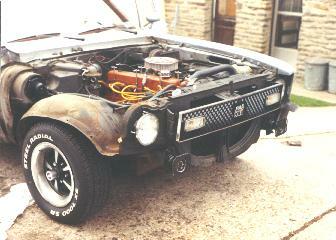 Here the bumper shocks are installed in the frame. 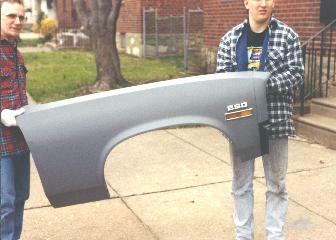 My good friend Brian (on the right) and his father hold up the brand new GM fender for me to photograph. Brian prepped and primered it for me. The new fender extension and the fender to bumper filler are already installed. 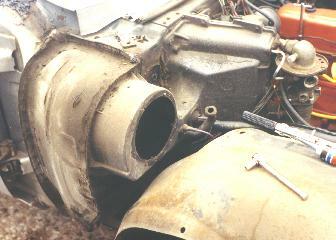 The pic on the right shows the inside of the fender and the radiator overflow bottle. It tucks inside the fender nicely. The new fender is back on and fits great. 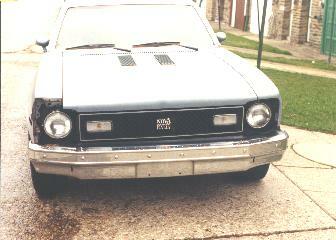 It's starting to look like a Nova again. 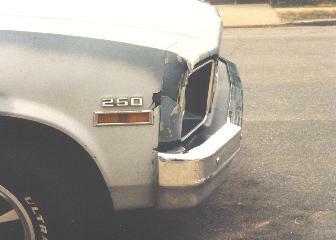 A good look at the fender extension and the fender to bumper filler. The marker light and engine emblem fit great. The hood is back on and the fender lines-up perfectly. All that's left to do is to install bumper and headlight buckets. I don't know why there aren't any pictures of the completed job. Either I ran out of film or I was too excited to drive it again and forgot to take a pic.